During the holidays, quiche is my gateway vegetarian recipe. It’s a wonderful bridge for those who might be a meat and potatoes kind of person to those who want to load up on vegetables. 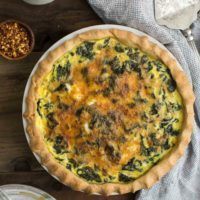 This kale quiche is one of my favorites to make and you’re probably noticing a pattern with kale and garlic (I love it). Best of all? This is my go-to crust recipe for pies and quiches. It’s easy to make an extra crust if you’re pie making. Store it in the refrigerator or freezer until you’re ready to make the quiche! 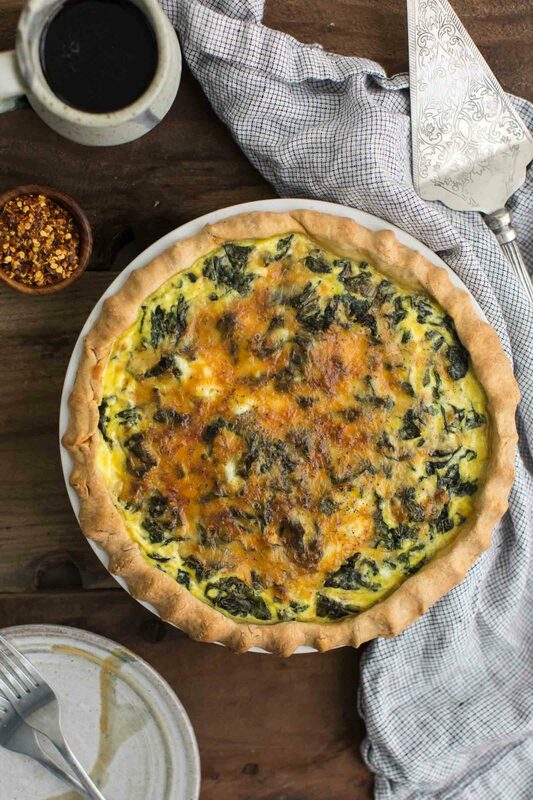 Impress your holiday guest with this flavorful quiche. The garlicky kale and the crust can be made ahead of time for simple prep day-of. To make the crust, combine flour and salt in a large bowl. Cut in butter and cream cheese using a pastry blender or your fingers until butter is pea sized. Add water and maple syrup and work into dough until it begins to come together. Shape dough into a disk, wrap in plastic and let chill for 20 minutes in refrigerator. Preheat oven to 425°F. Roll out dough and crimp into a 9 inch pie pan. Parbake the crust for 10 to 15 minutes until lightly golden. Remove from oven and set aside. Reduce heat to 375°F. While crust is baking, heat olive oil in a pan over medium heat. Add shallot and let cook 3 to 4 minutes until translucent. Add garlic and cook 1 minute until fragrant. Add kale to the pan and cook until kale is wilted. Remove from heat and set aside to cool. In a large bowl, whisk together eggs, milk, salt and pepper. Transfer kale into the prepared pie crust followed by 3/4 of the cheese. Pour egg mixture into the crust. Sprinkle remaining cheese on top. Transfer to the oven and bake until eggs have set and puffed, about 45 to 55 minutes. Let quiche sit 10 to 15 minutes before serving. 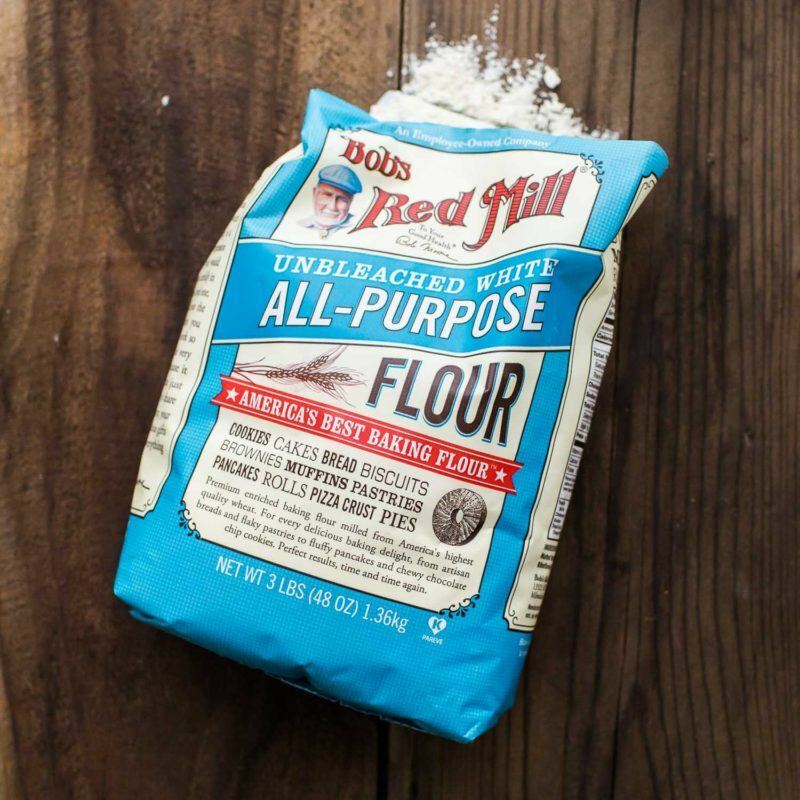 Gluten free: Use Bob’s 1 to 1 Gluten-Free Flour Mix for a gluten free crust option. 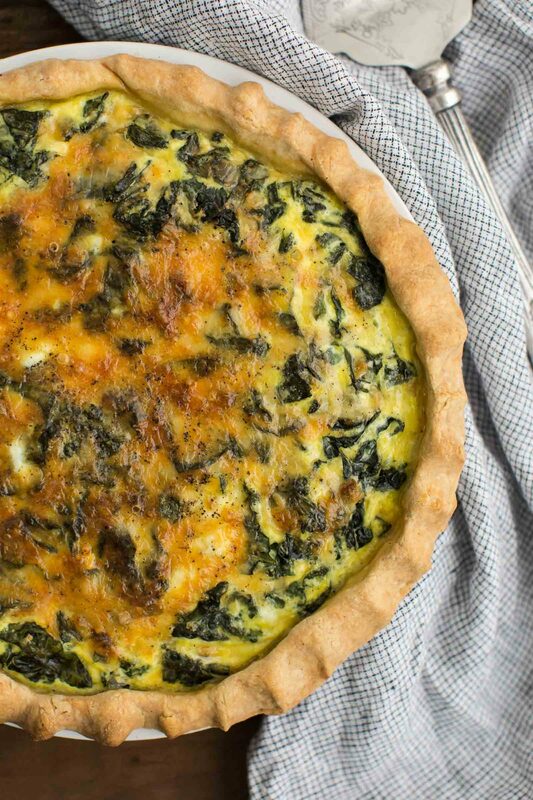 Greens: Make this quiche with your favorite greens instead of kale. Collards, spinach, or swiss chard would be excellent alternatives. Cheese: I love a strong cheese in this quiche. Try it with blue cheese instead of sharp cheddar. Or use a more mild cheese such as havarti or swiss. I’m normally an all-wheat or alternative flour kind of gal but during the holidays, I break out the all-purpose flour. Not everyone in my family loves the wheat/alternative flours as much as I so using Bob’s AP flour is a great way to still showcase vegetables but not completely overwhelm them! I’ve been worried about my Dad’s reluctance to eating veggies and his bigger-than-normal servings of meat, so this is a great way to sneak extra greens into his diet. I do! When I worked at the bakery, we did this quite often. Such a time saver! great time of year for this, I have a go-to version that’s similar but this looks better with the cream cheese-maple syrup and other flavors in the crust! thank you for this recipe! This recipe could get me back to eating quiche (haven’t had it in years). I get very tired of the same old quiche, and don’t like the flavors that well, so this would be a very pleasant change. 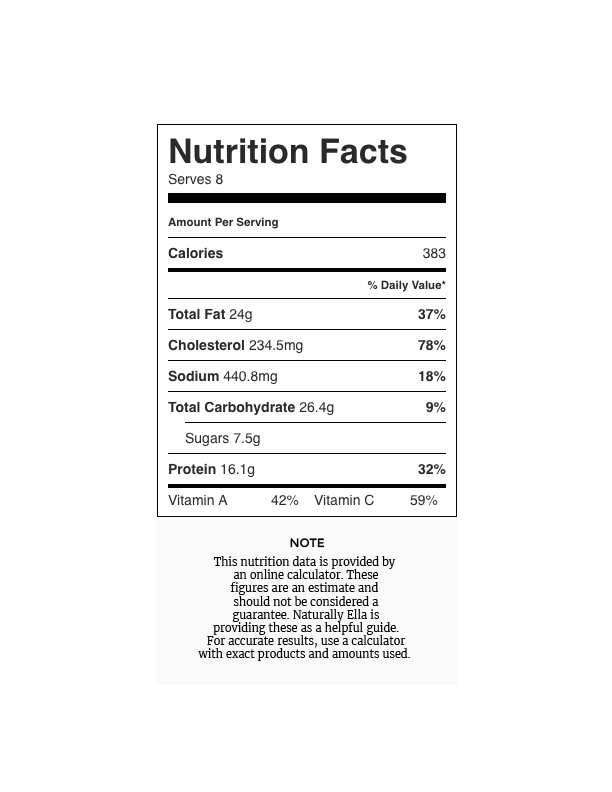 If I’m making this for breakfast, I usually serve it with fresh fruit. If it’s made for lunch or dinner, a lightly dressed salad is a nice side! I just tried this recipe and used small diced broccoli stems instead of kale. I failed in making the dough liquid proof, and since I used a cake mold with removable bottom, it leaked out a bit. I quickly put it on a baking tray and into the oven and luckily it stopped leaking. So despite my own failure it still came out nicely and it tastes sooooo delicious, that I could eat the whole thing by myself! Usually I am wheat and mostly grain free, but I did an exception for this recipe. I would like to use it more often but think I would need to figure out a grain free dough option. Thanks for this recipe! I don’t have cream cheese at home.what could I do in it tat it works? Extra butter- all butter crust work well too.